Last year anime audiences everywhere went crazy for the cinema release of Dragon Ball Z: Resurrection F. As the film arrives on DVD and Blu-ray in the UK, join us as we take a look at how Akira Toriyama's mega-franchise was able to regain its crown as the king of anime action. When it was announced that 2013 would see a brand new chapter of Dragon Ball Z for the first time in nearly two decades, fans must have thought Shenron had granted their wish. In many ways, DBZ never really went away, with a never-ending series of videogame releases, and numerous re-releases of the series itself. Not forgetting, of course, Dragon Ball Kai, the special edition remix of the original story, that was re-edited to hem closer to the manga, and given a 21st century set of spit and polish. The feature film Battle Of The Gods, however, was something entirely new. It was to be a brand new part of the Dragon Ball canon, set after the events of the series concluded, and featuring a story and new characters by creator Akira Toriyama himself. The new film introduced us to a new formidable foe Beerus, the so-called God Of Destruction. Fearsome he may be, but the franchise's sense of humour meant that he (and his companion Whis) were also extremely entertaining and a great addition to the Dragon Ball world. The whole film was a ton of fun in fact, with the occasion of Bulma's birthday party a perfect excuse to get all the cast together again. Although it took a little while for Battle to make it's journey to the west, when it did so it met with considerable success. The film received limited cinema screenings in the US, UK and Australia to an enthusiastic reception from fans, before arriving on Blu-ray and DVD. That wasn't the end of the story though as in 2015 Toei announced that there was to be another brand new movie, and like the last one this would be an official new story supervised by Toriyama. 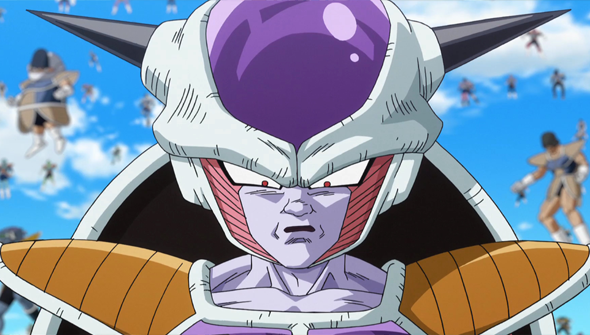 The second movie had fans extra excited from the off, as it was revealed it would see the return of arguably the franchise's most iconic villain- Lord Frieza. Last time we saw him he was blasted into smithereens, but as any good Dragon Ball fan knows, in this series Death is little more than a temporary setback. With the help of his remaining loyal goons, Frieza is brought back to life and he has but one thing on his mind: revenge. Entertaining as Battle Of The Gods was, there was a bit of grumbling from some fans that the movie was a little light in the action department. The action that was there was as good as ever, but admittedly there could have been more of it. Second time around though, they were careful to avoid any such accusations. And the choice of villain was a key factor here. With Frieza back you're guaranteed some pretty epic action, after all. The set-pieces here are easily among the biggest the franchise has seen. The stand-out here has to be the Frieza Force's assault on earth, which is a battle on a scale the series has never seen before. The screen is absolutely filled with Frieza-uniformed baddies and only the plucky Z Fighters stand in their way... and this is all before Goku even arrives. A lot of fans will be above all waiting for the rematch between Frieza and Goku- especially as our hero has gained even stronger power since the last time they fought. Frieza too has been training extra hard to defeat his nemesis, so when that battle finally comes it will not disappoint. 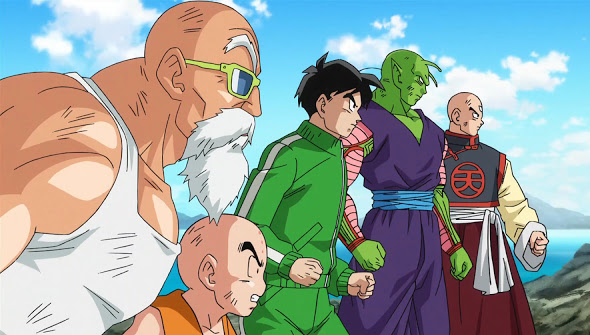 Although it's more focussed on the action, Resurrection F is still full of the comedic and fun character moments that have always been an important part of Dragon Ball. 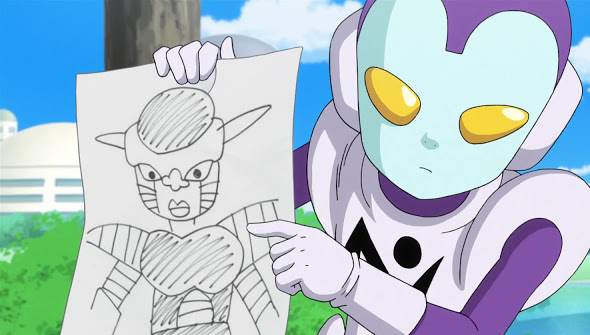 It's great to see Beerus and Whis make a return and dedicated fans of Toriyama's manga output will get a kick out of seeing Jaco The Galactic Patrolman make his screen debut. Resurrection F met with an even more rapturous fan reception than the previous film. It opened in Japan at number one in the box-office -beating out heavy-hitter Furious 7. Ultimately it went on to become the 6th highest grossing Japanese film of the year and scored an animation of the year nomination at the Japan Academy Prizes. It also did amazingly well in limited release in the US and UK. Funimation's US release of the film managed to break into the top 10 highest grossing anime American releases ever, becoming the first independent released feature to ever do so. In the United Kingdom, Manga Entertainment's release proved so popular it was expanded from a one-day event to two weeks, and even managed to break into the box office top 10. Fans in the UK were even treated to an encore presentation- in 3D. Following the release of the new movie, it was announced that a new TV series would begin airing, and it would be named Dragon Ball Super. Despite the massive success of Resurrection F and the fact that the show has been airing in Japan since last summer, there's oddly been no sign of Super getting an English language release (at least not in the US or UK). It can only be a matter of time- there's no doubt about that. While fans wait impatiently for their chance to get their hands on the next chapter one thing is for sure. Dragon Ball is back in a big way- and it's not going to be going anywhere anytime soon. DRAGON BALL Z RESURRECTION F IS NOW AVAILABLE ON BLU-RAY AND DVD IN THE UK FROM MANGA ENTERTAINMENT AND IN THE US FROM FUNIMATION.